It’s almost Valentine’s day, and for cooking class I wanted to do something special to cherish love and friendship. In my country that’s what Valentine”s day is actually called: “Day of Love and Friendship,” therefore I chose to do Strawberry Shortcake, my husband’s favorite treat, pairing it up with a sweet book about friendship: Amelia Bedelia Makes a Friend. I found a fabulous blog with stories about where dishes came from, called Food History. There they say that the first recipe for Strawberry Shortcake dates from the mid 1800. However, they note that shortcake started out in Britain, first as a scone, and the first recorded mention is in Shakespeare’s The Merry Wives of Windsor. However, I couldn’t find the passage where Shakespeare talks about shortcake… In that blog they also say that the first recipe for the shortcake was written in a cookbook from 1594. When the pioneers reached the Americas, they paired the newly found strawberries with the shortcake, probably to celebrate the coming of summer, towards the end of the 1800’s. Here’s the first recorded recipe for Strawberry Shortcake. As I mentioned before, Strawberry Shortcake is my husband’s favorite treat. I had never had an actual shortcake before I met him. One day, a little after we moved in together, I decided to look for the perfect recipe to surprise him. I went through 4 batches of shortcake — from Angel cake-like to biscuits – until I found the perfect one. Later on, when we went to Ireland and had the best scones in my life, I modified that recipe to resemble the soft and lightly moist consistency of my Blueberry scones. The girls put the entire recipe together on their own. I just helped getting the shortcakes onto the baking sheet and in and out of the oven. 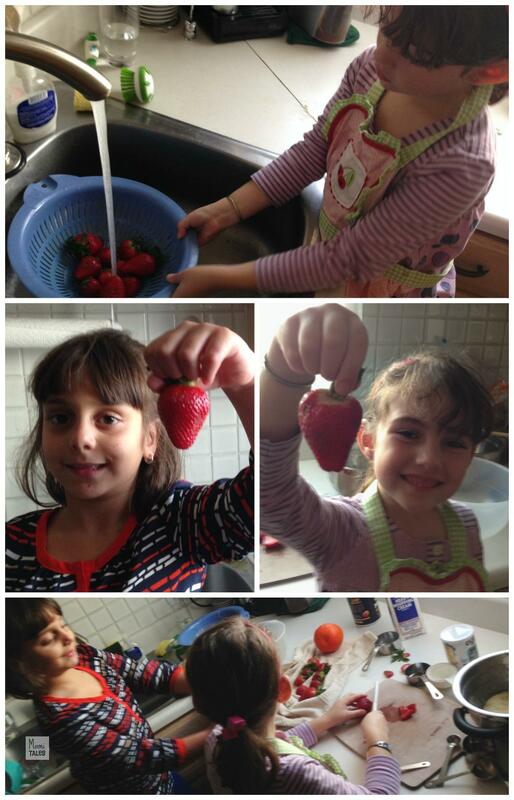 They thought the strawberries looked like hearts, so they wanted their picture taken with them. They used the Curious Chef knife to cut the strawberries, which is perfect and safe for little hands (specially if the fruit is soft). As with most of our classes, I also looked for a book to pair with our recipe. This week we read Amelia Bedelia Makes a New Friend, by Herman Parish. In the book the recipe they talk about is Blueberry Muffins, but regardless of that, the key thing for me was to read something to the girls about the importance of friendship, and how you can have old friends and new friends. 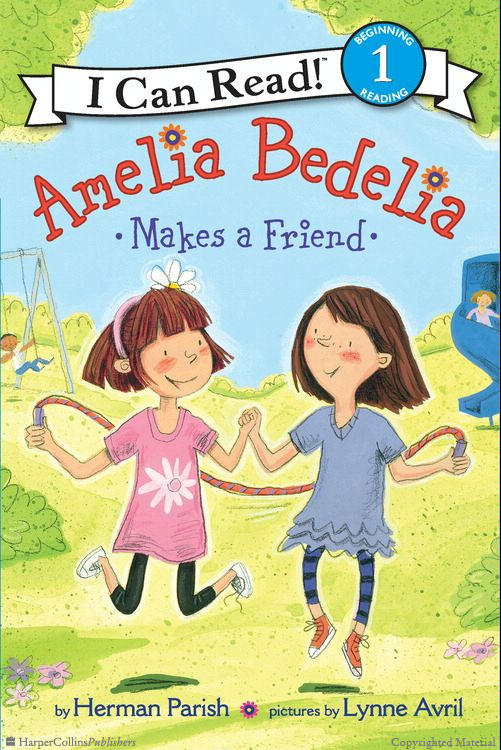 The story talks about how Amelia’s best friend, her next door neighbor, moves to a new house. Heartbroken, Amelia moans the loss of her friend. However, she soon discovers that her new neighbor, an old lady, is just as fun as her old friend was. And now she has a new old friend, and a young old friend. Making new friends doesn’t mean you have to stop loving your old ones! I hope you all have a wonderful Valentine’s day full of love and friends. And hopefully with lots of Strawberry Shortcake too! This looks so very delicious! Yum! Almost as good as yours look! Thanks for stopping by, and these Shortcakes are absolutely amazing 🙂 Let me know if you try to make them! 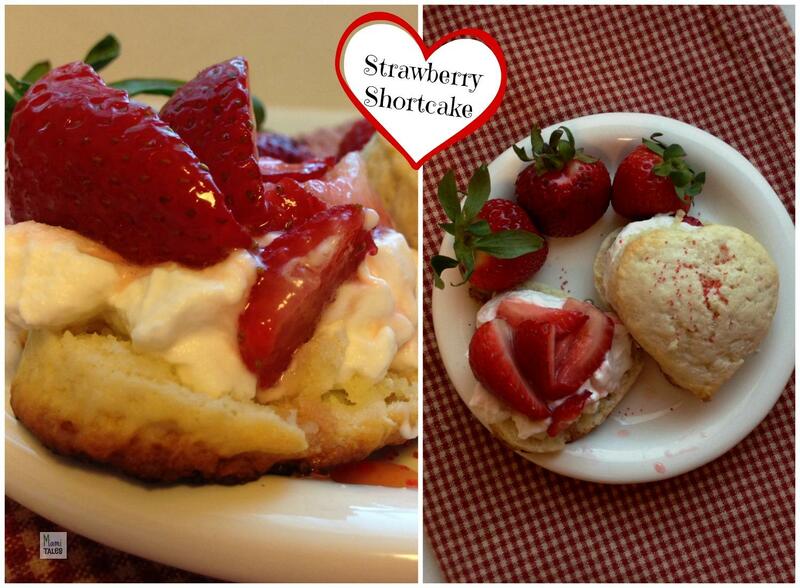 I love shortcake that’s dry and crumbly! This looks like it may have been up my alley! Yum!